This is mainly for family members, so I won’t mind if other readers move on to something else. So the folks can see what kind of place Leive & I moved into last December, here is the fourth in a series of pages featuring photos of the house. There are fourteen steps to the top. 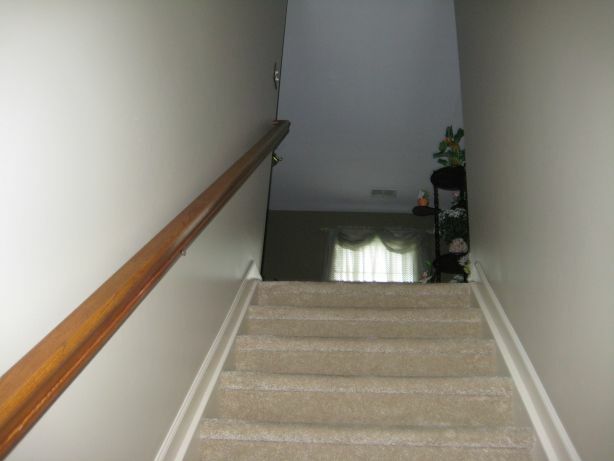 At the top of the stairs is another living room, what we call the loft. 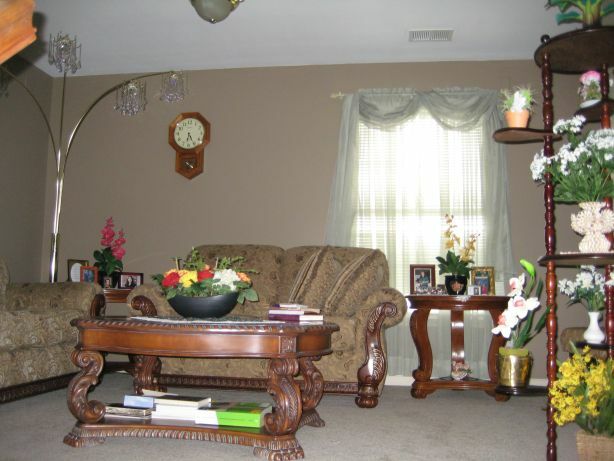 Here we have two couches, a large coffee table, some smaller tables, a lamp, and more of Leive’s decorations. Sometimes I call the loft our shrine to Lindy, because of the pictures on the tables (LOL). Those of you who’ve been in our living room in Florida will remember this decoration. 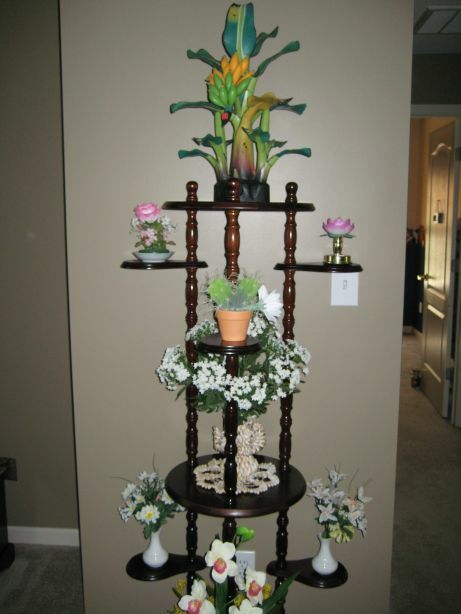 The shells and the banana tree give it a nice Filipino touch. 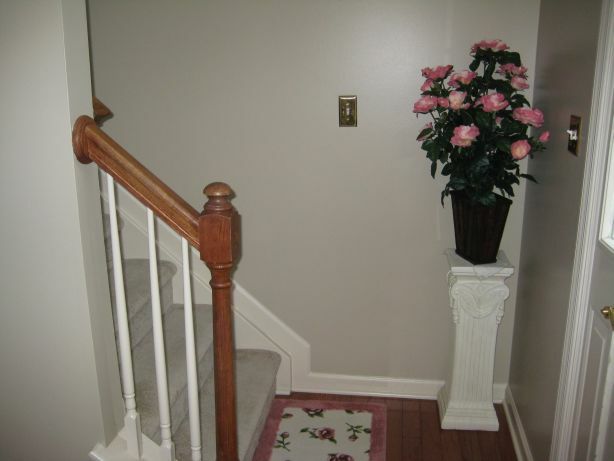 Looking northeast (left from the stairs), here is the hall leading to two of the bedrooms, including the master bedroom, and the laundry room. Looking southwest, to the right as seen from the top of the stairs, we see the other hallway, which goes past the blue bathroom, a closet and the other two bedrooms. We’ll go southwest first. 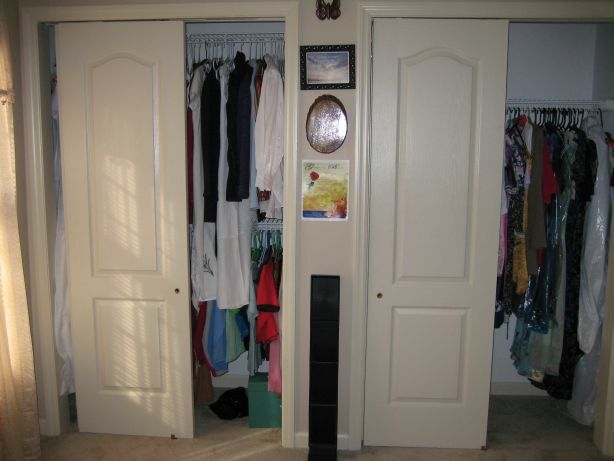 Here is the previously mentioned closet on the right. As you can see, we don’t keep any skeletons in it..
Then on the left is the blue bathroom. We went with a fishy theme here on the decorations. I have a feeling this bathroom will be the busiest, after the kids get here. 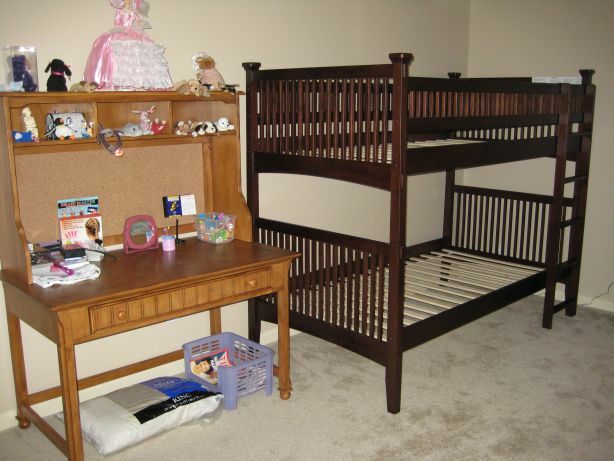 On the right, after the closet, is the room where we plan to put two of the girls. 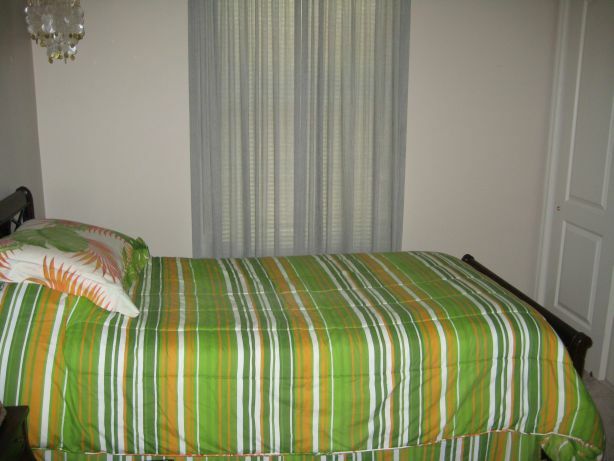 I’m sure you’ll recognize the bed, which has been in the Kimball family for at least three generations. 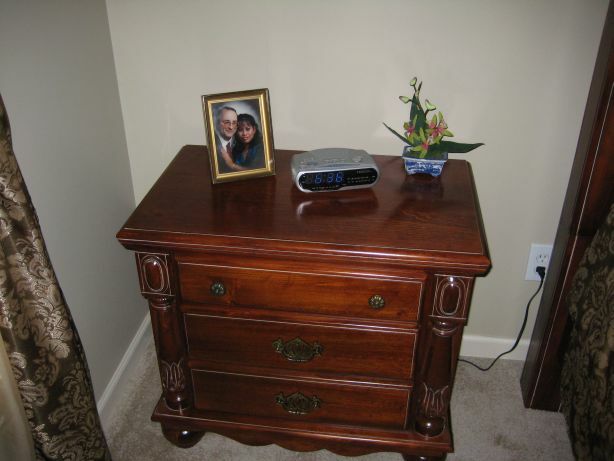 The dresser and the night table are new. Against the opposite wall, we have a new bunk bed and desk. No mattresses for the bunk yet, sorry. So this means we’ll have an extra bed, even when all of the kids are here. 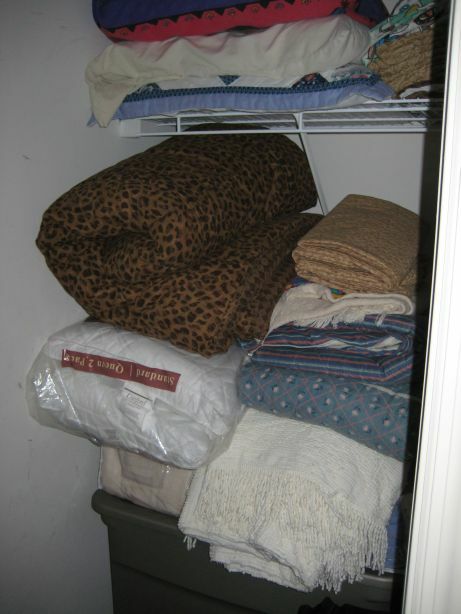 We have a double closet against the northwest wall, so you have to come into the room to see it. Yes, Leive has filled it up with clothing for the girls already. For the boys we have the room at the end of the hall. 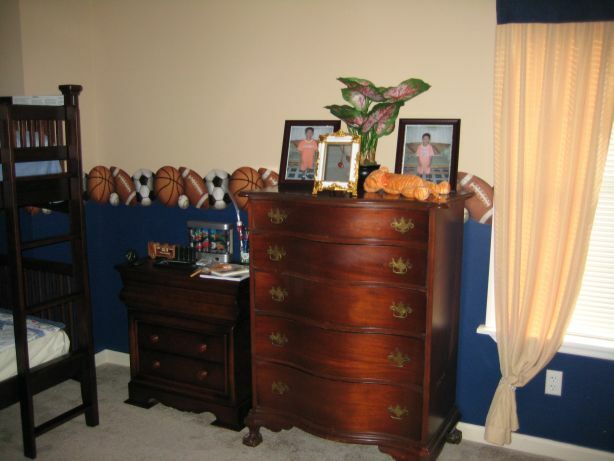 We chose that because it has a sports theme (pictures of baseballs, footballs, etc. painted on the walls). 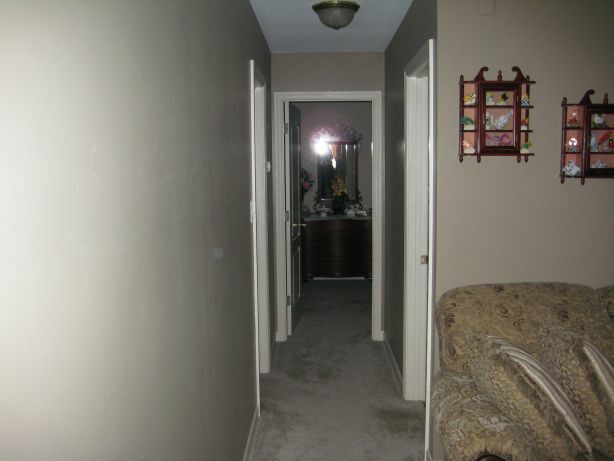 The wall on the right is bare, and since the room lacks a closet, we’re thinking of having one built there. 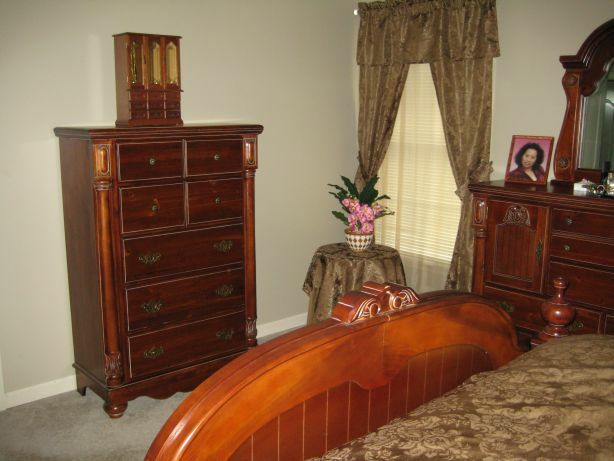 Here you can see the dresser and the nightstand. 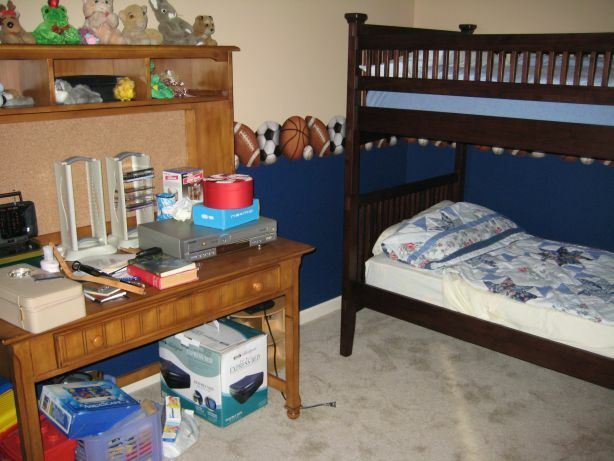 And here to the left you can see the bunk bed and desk we got for the boys. 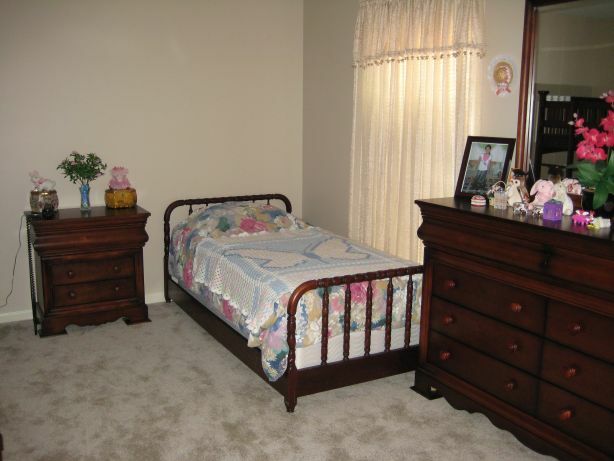 Incidentally, Rezia stayed in this room when she was with us, in the summer of 2007. Now let’s go northeast, down the other hall. 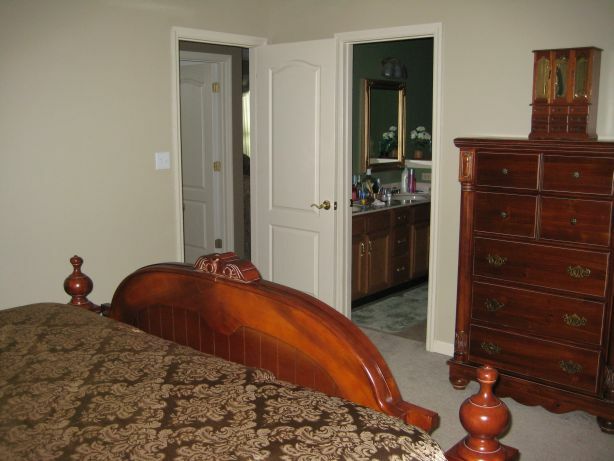 On the right is the laundry room, on the left is the master bedroom, and the last bedroom is on the end. 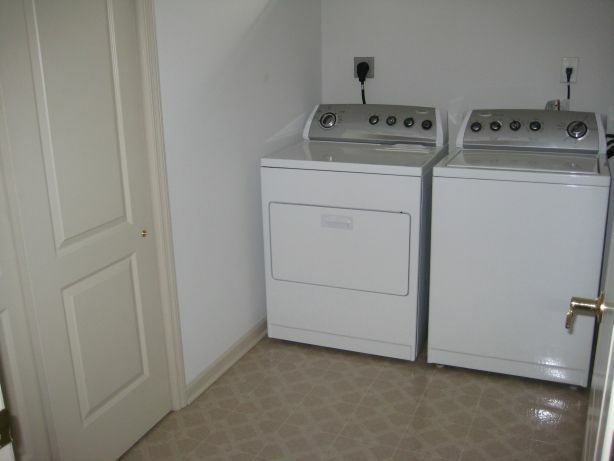 We got a new washer and dryer, because the previous owners took theirs with them. 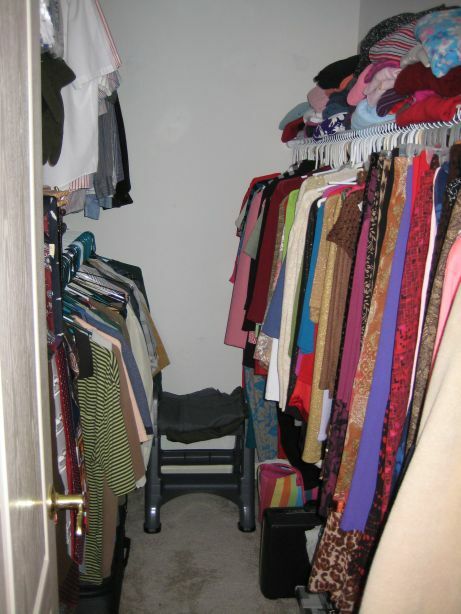 The door to the left conceals a closet that contains a water heater, space for a clothes hamper, and shelves for detergent, bleach or towels. 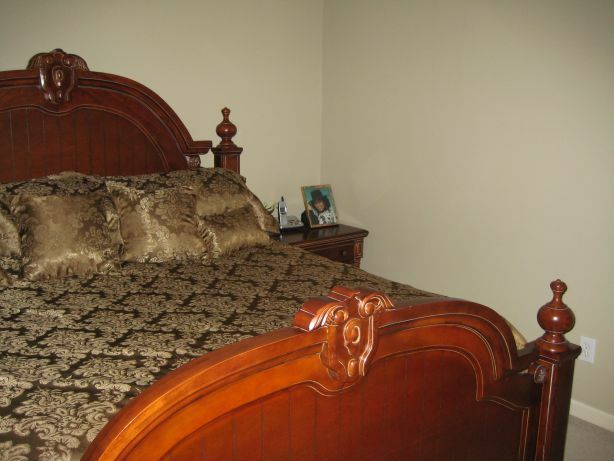 And now for the master bedroom. Leive chose some of the fanciest furniture we bought for here, so one picture won’t do the room justice; that’s why I took more here than in any other room. 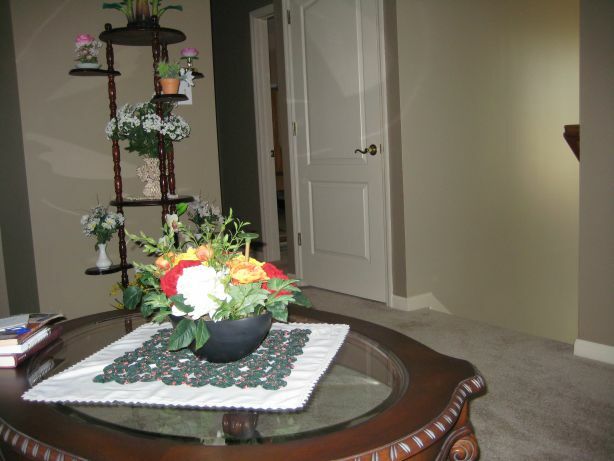 First, here is the view from the door, which is in the south corner. 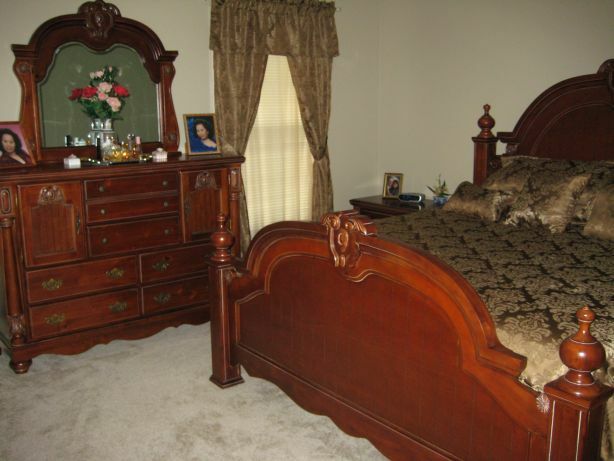 This shows the bed & Leive’s dresser. Now a view from the east corner, looking west. 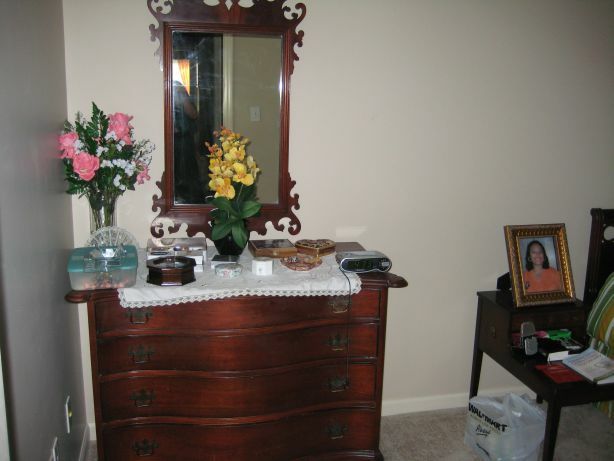 This reveals my dresser and the decorative table Leive put in here, much like the one in the family room downstairs. From the west corner, looking east . . .
And from the north corner, looking south. 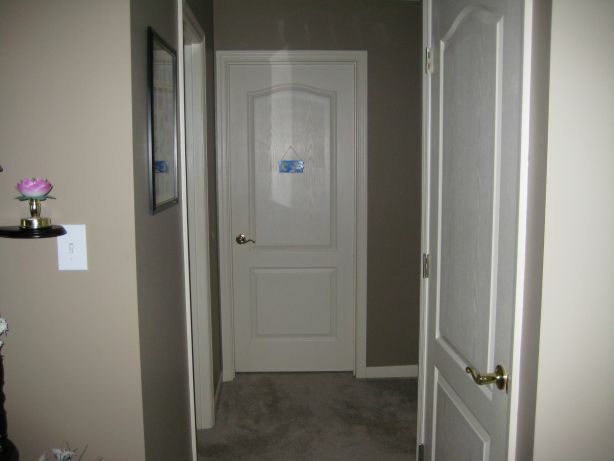 From this angle you can see both the door to the hall and the door to the green bathroom. My nightstand and Leive’s. 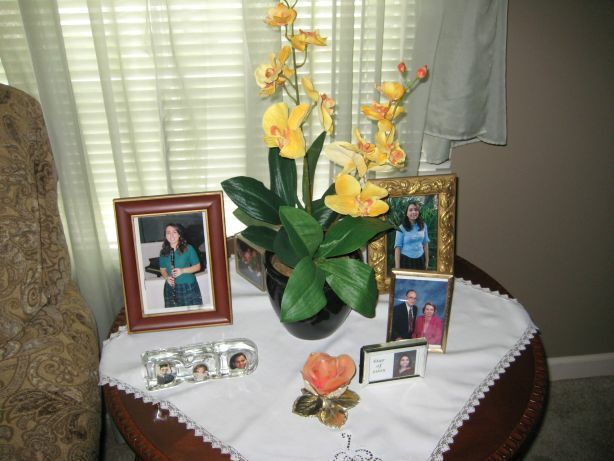 She managed to find some appropriately colored fake orchids, green for me, orange-red for her. 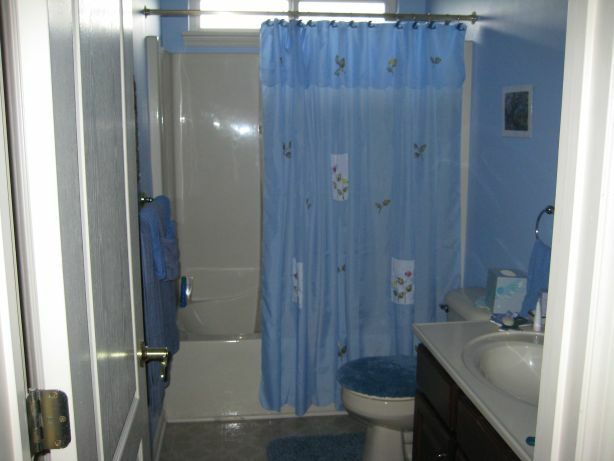 Here’s a peek into the green bathroom. 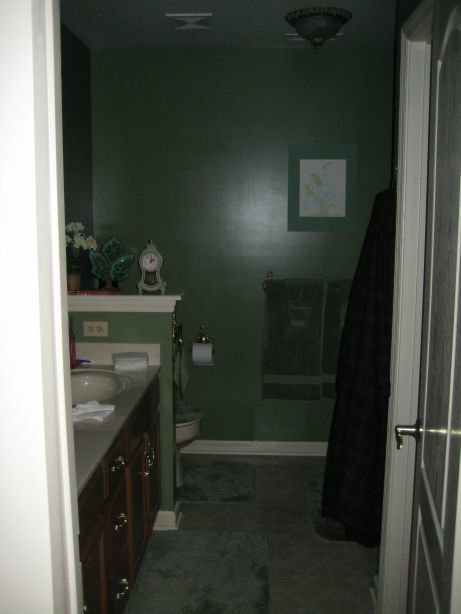 On the right are both the bathtub and the walk-in closet (next picture). Finally, the bedroom at the end of the northeast hall. We want to put the eldest of the five kids we plan on adopting in here. 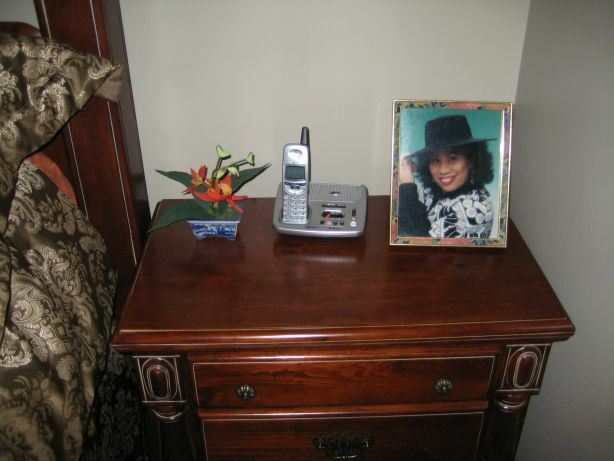 Some of you may recognize the furniture from my grandmother; I understand the night table dates back to the 1820s! Leive preferred to sleep here during the cold months, because when she has the portable electric heater on, this becomes the warmest room in the house. There is one more closet at the foot of the bed. This concludes the tour upstairs, so I have brought you back to the loft. Carefully follow the stairs back down to the main floor, please. 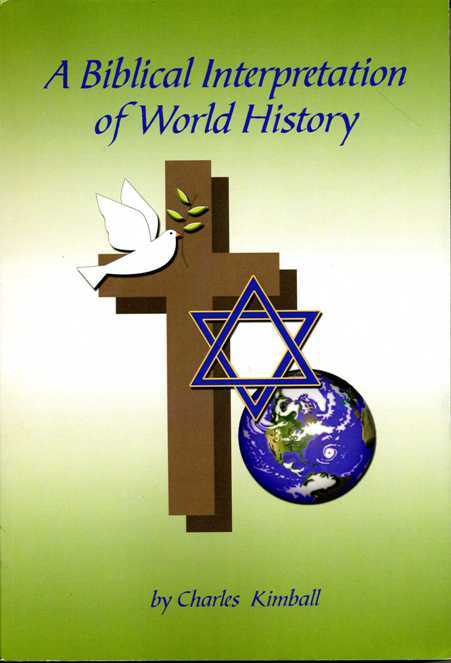 Please, remember us here in Bohol,Philippines; this your brother goben if you think you are still my sister and a true christian now in the U.S.A thank you hope to know and hear you soon; you can call me anytime, my mobile phone # 09078320399/ and my ym is cociacrim@yahoo.com/gobenbendoy@yahoo.com; my gamay me nga internet cafe diri sa Bohol,pinaagi ni Stephen Brian akong ikaduhang anak nakatapos sa Com.Technology ug nagtrabaho na karon sa smart comm.phillipines;bisan wa nako ninyo tagda, bisan nalang gani sa pag balus sa akong sulat ninyo apan wa ninyo buhata gi ignore nako ninyo,peru salamat sa dugay na nakong pangita sa inyong website nakit-an mo nako,tinood gyod ang sulti sa Ginoo nga ang mangita makakaplag, hinaut wa nga wa naman si papa; magtinagdanay gihapon ta isip igsoon ug mga anak sa Dios, ug ayaw na patunto sa dugay nang mga pagdaut nako, kay kana trabaho ug paagi ni Satan atong kaaway ug kaaway sa Dios. salamat sa pag basa ning medyo taas taas nakong sulat nimo Leive. He discussed the overview of the 49ers offense before the NFC Championship Game but they ended up losing to the nfl nike jerseys. enough space to work with Brees. Until today, he basically didn’t see any offense by the nfl nike jerseys from Ohio State. While they are in the United States or in Australia, enjoy thousands of satellite channels directly in your PC!